I have been dealing with Focus for 5 years now for both advertising and printing, and have found that more and more people are using the magazine when looking for work to be done. 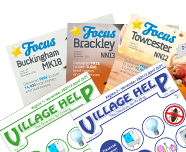 The Focus magazines adverts have really worked for us, on top of that I have been impressed with the high level of service I receive from Karen. Once again, your promoting our Stamp Fair and indeed Stamp Club membership has resulted in many phone call enquiries, far in excess of any other local advertising. After running several adverts in the Focus Brackley Magazine with you I have received an order from a Brackley based customer from the displayed quarter page advert. After the initial order, I was asked to quote for further furnishings to two further rooms! I have been extremely happy with the level of response from adverts I have placed in Focus Towcester and I think it is unique to the area in being a magazine which people actually read and I get many enquiries from it. It's also the the first place I look if I need something locally! I just wanted to say that we have been very pleased with the results of our adverts with you. We have picked up three clients so far and have just had another enquiry. Definitely the best response to advertising we have ever had. Just wanted to say a big thank you for the editorial with my advert. I had a large group of new customers who came in today totally because of the advert!! Everything you'll need to know to advertise with us. Don’t miss placing your advertisement with us.